Interactive theater at its funniest. 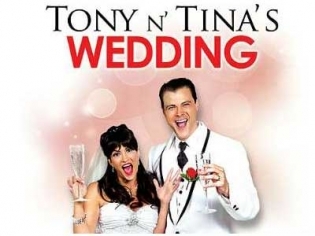 Attend the crazy wedding of Tony and Tina and become part of the story. Dance at the reception, catch the bouquet or the garter, and toast the happy couple. It’s all part of the fun at this zany show. When you go to see Tony and Tina’s Wedding you are not really going to a show but to a wedding as an invited guest who is asked to participate in all the revelry. The story is of two slightly dysfunctional Italian-American families who have come together to celebrate the nuptials of Tony and Tina. As with any family there are the some rather unusual relatives to deal with, perhaps a drunk uncle or a pregnant sister. Of course there are the crazy guests as well and don’t forget the tacky bridesmaids dresses. A hilarious spoof of stereotypical weddings and wedding traditions, you will have a great time interacting with the characters as the comedy unfolds. You can enjoy the full Italian dinner at the reception and toast the bride and groom with champagne when they cut the cake. A zany send-up of Italian weddings which will have you laughing at every turn at how spot-on the jokes and characters are. Just-married couples get in free when they show a marriage license and ID at the theater. All bachelorettes get in free with at least 3 full-price paid tickets in any seating section. Run as fast as you can the other way! Bad show! Boring , poorly done and run down venue. Food was blah and they charge you 4.00 for a bottle of water! This show is great for someone who is outspoken and fun at heart. Go ahead and be part of this show, its so interactive and a great experience at least once in your life. We had so much fun seeing this show. The crowd interaction was just amazing. The energy was so high. The show was so good that you almost feel like you’re apart of it. I would see this show again if given the chance. Who doesn’t enjoy going to a wedding? The best part of this wedding is you are NOT required to bring a gift, or attend a shower, or buy a real expensive UGLY dress. You are just a guest who gets to enjoy dinner and dancing. Now if you aren’t outspoken, you may not like this show! Otherwise please get ready for a very interesting night guaranteed!